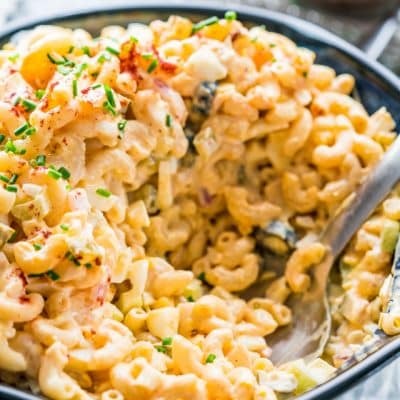 This easy Deviled Egg Macaroni Salad recipe tastes just like deviled eggs, super creamy and loaded with celery, olives, pickles and red onion. Quick, delicious and ready in 30 minutes! This pasta salad is a match made in heaven! 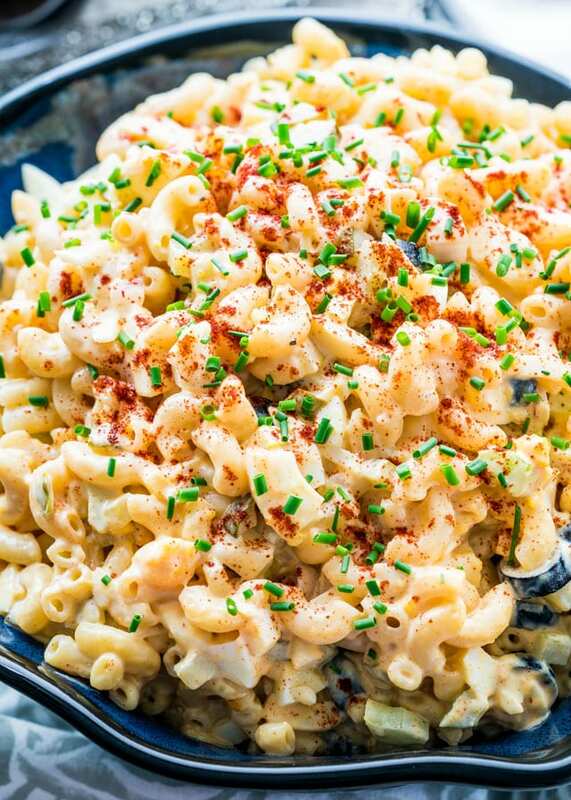 The delicious creamy flavor of deviled eggs paired with a macaroni salad loaded with goodies? You’re going to be the hit of every barbecue you go to in the summer! You have to give this a try, especially if you have lots of eggs leftover. This recipe makes such great use of them and this also makes a perfect side dish. 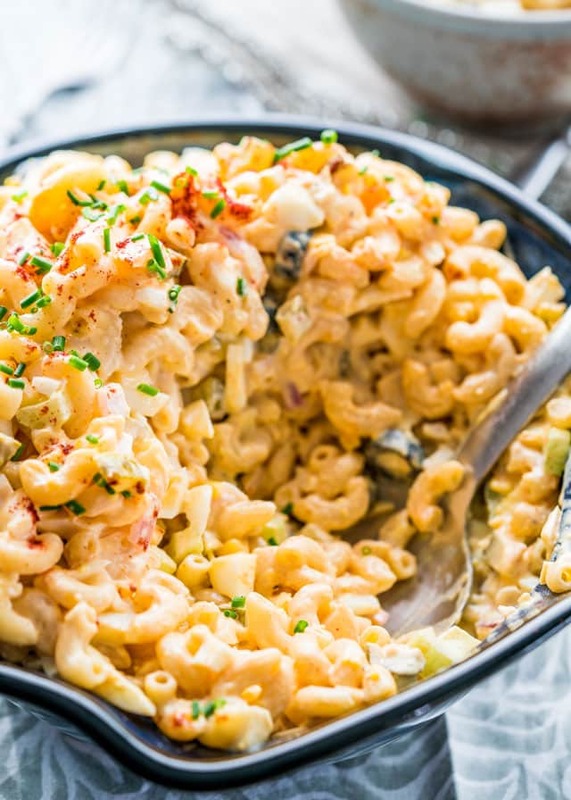 Just look at how incredibly creamy this macaroni salad is. No dry pasta in my kitchen! I always make sure to load my pasta salads up with homemade dressing so even if you make it a day or two ahead of time, each bite will still be nicely coated. 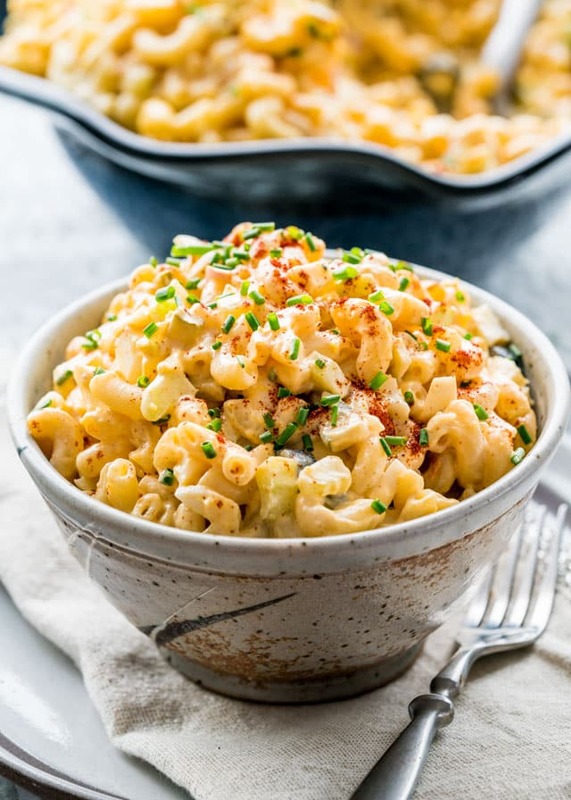 What Ingredients Do I Need to Make Deviled Egg Macaroni Salad? You can swap the macaroni out for other small types of pasta. Small shells, farfalle, rotini, etc will work for this salad. Not a fan of dijon mustard? Regular yellow mustard will work just as well! What Else Can I Mix Into My Macaroni Salad? I like to throw a lot of ingredients in this recipe like pickles, red onion, celery and black olives. Some people don’t like celery in their macaroni salads, so if that’s you, then simply don’t add them. I personally like the extra crunch you get from the celery. I love the saltiness that the pickles and olives give this salad. With a heavier and creamier dressing, that bit of zing really helps keep those flavors alive. Cook the pasta: Use the box as a guide and cook according to package instructions. Rinse well with cold water after straining. Prepare the eggs: Peel your eggs and cut them in half. Scoop out the yolks and set them aside in a bowl. Chop the whites into pieces. Prepare the dressing: Mash the yolks with a fork until smooth. Season them with salt and pepper, then add the mustard and mayo. Stir everything until well combined. Prep the mix-ins: Chop the rest of the ingredients into small bites. Assemble the salad: Add the macaroni to a large mixing bowl. Add the dressing, egg whites, the rest of your mix-ins, and paprika. Mix everything until evenly coated in the dressing. Garnish and serve: Sprinkle the salad with smoke paprika and chives, then enjoy! Rinse the pasta: After you strain your noodles, rinse them well with cold water. This will halt the cooking process and prevent your macaroni from sticking together and forming a huge noodle blob. Peeling the eggs: For easier peeling, transfer the eggs straight from the boiling water to an ice bath. This will cause the hardboiled egg to shrink inside its shell. Once they’ve fully cooled, give the eggs a quick tap around the circumference and peel. Use a variety of mix-ins: When choosing what I want to add to my macaroni salad, I look for a few factors: crunch, salt, and tang. Using pickled veggies is such a great way to brighten the dish up. Chill before serving: Let everything hang out together in the fridge for at least one hour before serving. When those ingredients get to sit together, the flavors get even better! Store this salad in an airtight container up to 5 days in the fridge. If you’re making this ahead of time, you can store it in a bowl that is well covered with plastic wrap. While you can freeze this if you want, it is best served fresh. The pasta and veggies may become mushy after being frozen and thawed. 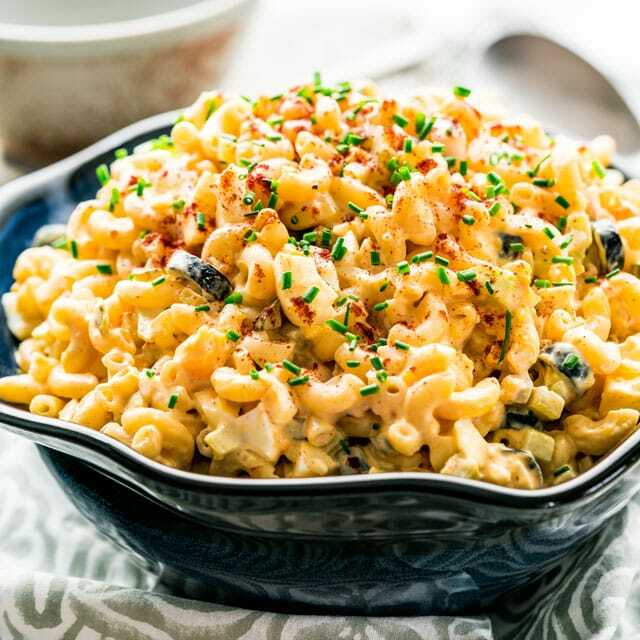 This Deviled Egg Macaroni Salad tastes just like deviled eggs, super creamy and loaded with celery, olives, pickles and red onion. 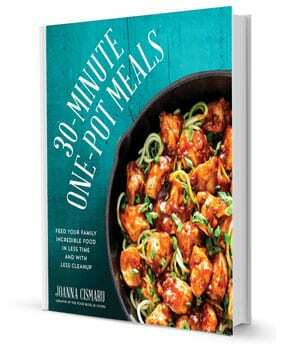 Quick, delicious and ready in only 30 minutes! Mash up the egg yolks with a fork, then season with salt and pepper. Add more salt and pepper as per your taste. Add the mustard and mayonnaise to the egg yolks and stir everything together until well combined. To get perfect hard boiled eggs all the time, add your eggs eggs to a saucepan, cover with at least 2 inches of cold water. Bring the water to a full boiling, you should see big boiling bubbles, turn off the heat and cover the pot. Keep the saucepan on the burner for about 10 to 12 minutes. At this point I like to run cold water over the eggs and peel them under the tap, this way it's easy to peel the eggs and you get perfectly peeled eggs every single time. Adding a bit of salt or vinegar to your water for the eggs, will prevent the eggs from cracking while cooking. Just made it and it is DELICIOUS!!! Thank you for sharing the recipe! I am wondering why this is such a high calorie recipe…….eggs have about 77 calories each. I doubt that the macaroni is very high in calories. The veggies are low cal. 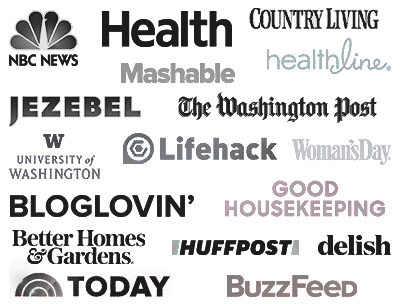 What is the serving size – 1 Cup? I know that regular mayo is high calorie – I always use “light” mayo and I’m sure that would make a difference. Would appreciate your thoughts/comments. Thanks! I went and took a look at the recipe! 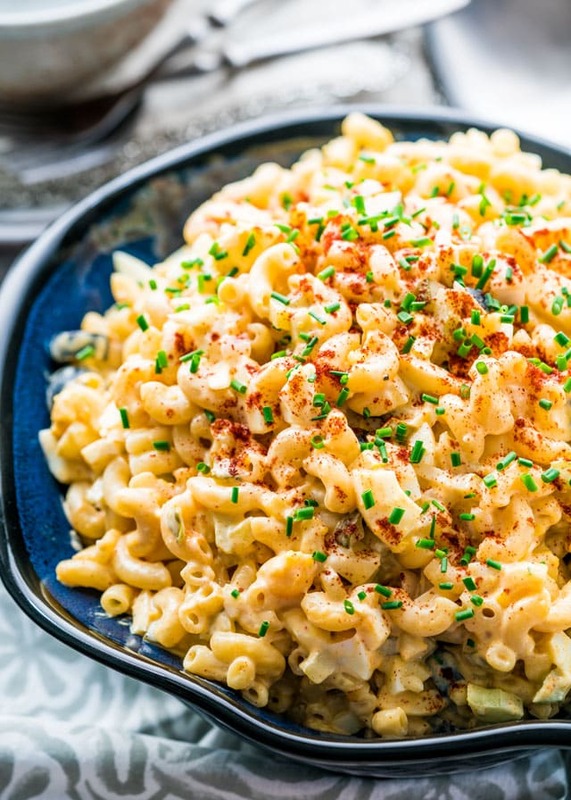 The macaroni and mayo make up most of the caloric content. Using light mayo will help for sure, and smaller serving sizes will make a difference too. This is a great receipe. I just made this recipe and it’s very tasty! I learned to drop my raw eggs into cold water cover with 2” of water and add a teaspoon of baking soda. Eggs peel easily every time. Made this salad with my own twist of green pepper and bacon. I skipped the celery since I was out. Voila deliciousness! Made this for the 4th of July!! It’s so good!! I added fresh dill to mine because I love the taste of dill. Thank for the recipe! This is the 3rd time in 2 weeks I have made this Deviled Egg Macaroni salad. My husband and neighbor can’t get enough of it. This time I also added chopped bacon to it. Love this recipe. So easy to make and so far it has been a big hit. Also, the tip on peeling the hard boiled eggs underwater is spot on. I will always do any of my hard boiled eggs this way from now on.